Usually I avoid rubbing your face in it, but not today. This image, which has been sitting on my desktop for a few months, is offered out of anger, grief, and extreme frustration with the press, the public, and the Obama administration–and most of all with the public. The photograph records a badly maimed soldier being delivered to a military hospital in Kandahar. Think of how many times you have read about IEDs and about wounds suffered from IED explosions. Did you ever imagine anything like this? Think of all the photographs you’ve seen of soldiers standing guard, walking on patrol, talking with villagers, or deploying for another mission. Did you ever consider how those photos were being used instead of images like this one? And while we’re asking questions, did you notice, when looking at the photograph above, how absolutely routine this event is to the medical personnel? Only the soldier jogging out the door looks a bit concerned, and he may be steeling himself against what he knows he is going to see up close. Everyone else, including the stretcher bearer, has the postures–that is, the attitudes–of complete habituation. The guy on the right could be waiting to take a number at the social security office. Something horrific, catastrophic, and uniquely terrible has happened to the soldier on the stretcher, but to everybody else it’s something they’ve seen a thousand times. If the war in Afghanistan were vital to national security, perhaps this sacrifice would be worth it. 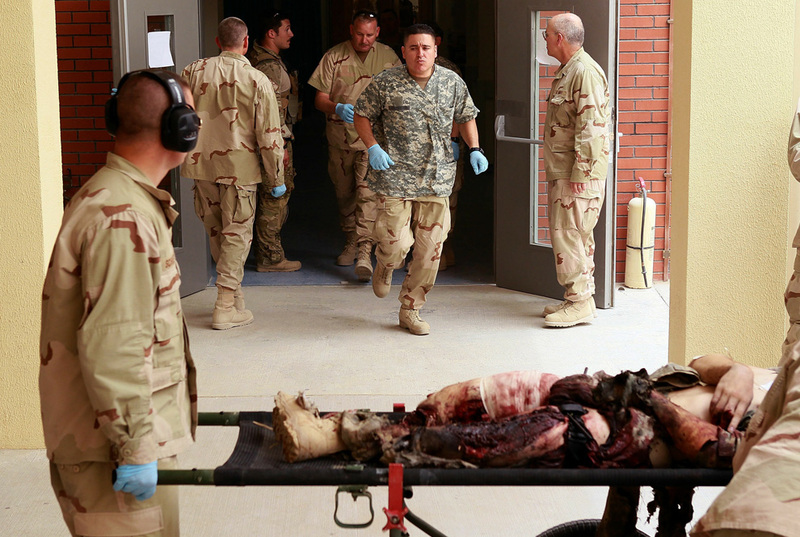 If you have to fight, you want your military to have the experience and other capabilities necessary to handle catastrophic injuries efficiently. But we know that national security is not on the line in Afghanistan. We do know that, don’t we? Two stories intersect today to underscore my frustration: First, press analysis of the WikiLeaks archive of 391,832 documents is exposing greater than admitted death tolls, abuses by US contractors, and brutality by other US allies, as well as US knowledge or and lying about this information. Second, New York Times photographer Joao Silva was badly injured by a land mine in Afghanistan. Leg wounds, and others as well. I think the basic problem is that people, at least collectively, decide to know. It is not the case that we know and then act. We decide when we will know, and then we are more likely to act. You can have the truth staring you in the face, but it doesn’t matter until you decide to suspend all the habits of amnesia, distraction, rationalization, and denial that are otherwise in place and reproduced continuously. Once we decide, we can look back and see that there was plenty of information there all along. But we have to make that decision. The question remains, what will it take to get enough people to decide to know that our war in Afghanistan is futile? Sometimes, a photograph will make the difference. But how many photographers and soldiers have to be used up until that day arrives? ← Previous PostCan You Remember When? Usually I avoid rubbing your face in it, but not today. Don’t. Rub away. This is the reality too few Americans, including politicians, see. Whenever I see a politician speak of the war as necessary I feel nothing but disgust and contempt. So much so I’d like to rub a foto like this right in their face; stuff it down their throat. They have no idea. And worse, they don’t care enough to get one. They vote on “appropriations”, nothing more. Would even publishing that photo of the dreadfully wounded soldier on the front page of every newspaper in the country help? I know many people — many of them with politics different from mine — who also understand the futile carnage of our presence in Afghanistan and Iraq. Our political class seems to have lost the ability to ask fundamental questions and is out of touch with the values of those they are supposed to be working for. Anyway, congratulations on an eloquent posting. Not even going to comment on whether we should be in AF/PAK or no, other than to state that I am no big fan of nation-building. (hint: kill them all, let G-D sort them out is more my style). But can you not see the gaping hole in your logic: at sunset of the final day of Gettysburg, Antietam, Shiloh or any other major Civil War battle, soldiers with wounds as gruesome as this (or even worse if possible) lay scattered across the field. Should we conclude the Civil War was pointless? Djflargo: Read my fourth paragraph, which addresses your point. Of course they are appearing as if they are used to it. Doctors all around the world appear like that. They are professionals, their job is to save peoples lives, they don’t let emotions get the better of them. Funny how you women and wimps back home complain about war when the soldiers themselves feel they are doing a good job. You aren’t fighting, you aren’t in danger, so you can’t talk, what you think doesn’t matter. Jeremy: Read the post again. Of course they know–that’s the point: horrific wounds are routine at that medical unit, and the public should know that. Criticism of the war is not criticism of the troops, but rather of the civilian policy makers. The distinction between administrative decisions and military implementation holds for all citizens, whether they are combat veterans or not. If the American public is going to authorize a war, accept its continuation beyond the original war aim, and pay for it, they ought to know the full material and human costs, including the suffering that is involved.